once things start growing. With the excessive rain, and the abominable heat, things get out of control quickly. My poor Confederate Rose (far left) started out o.k. It got a few whiteflies, but the ladybugs took care of them. Then they came back, and despite trying with all my might to wash them off regularly, they have devastated the bush yet again. I said I was going to use systemic pesticide on it this year, but I never got around to it, and now it's just black with sooty mold and eaten up with whiteflies. I doubt I'll have any decent blooms on it this year either, and I'm seriously considering just cutting it down. I can't stand to look at it as sad as it is. Since not much blooms in the very hottest part of the summer, and the things I did plant didn't exaclty take off, I have just a little color in the garden this year. 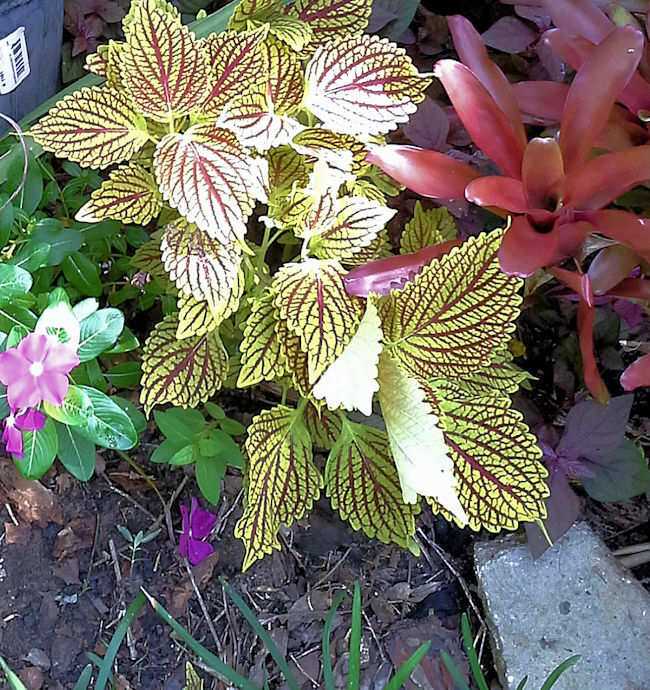 Of course, my coleus are always a bright splash of color. 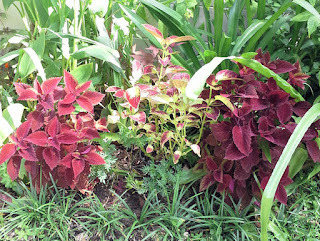 The two red sun coleus are exactly the same plants, but the one on the right gets more sun than the other. You can really tell the difference. The Japanese Giant in the middle is a little splindly, because it was further back, but getting buried, so I pulled it forward this morning. It's also growing in a pot, so hasn't gotten as large as it can. I keep trying to find a better place for it in the garden, but no luck so far. 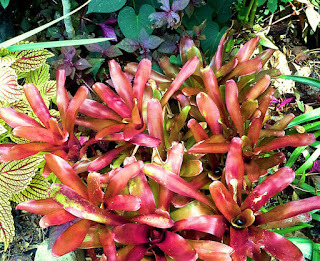 The "Fireball" bromeliad didn't color up as much as I'd like it to, but it hasn't gotten as much sun as usual because of all the rain. 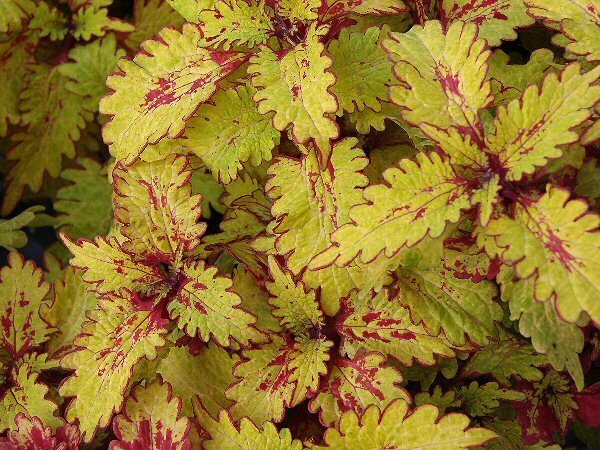 Still, it's a very pretty plant and adds a nice splash of color in that sunny spot. I can't believe that plant started out as one tiny little piece sent to me by a friend four years ago. I wish I had more sun for it, but you work with what you've got. The butterfly garden is just a mass of stripped Asclepias stems and shrimp plants that won't bloom. 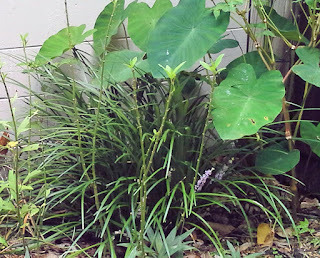 The giant Liriope is blooming, but the purple blooms are sort of hidden in and amongst the foliage. The taro (eddoe) plants are doing very well, and I'm hoping to get some nice tubers from those this year. I planted hyacinth beans and some other vines back behind them, but the slugs ate them before they could grow. There has been a real problem with slugs in that garden this year, as well as toads and lizards, which ate all my monarch cats before they could pupate. The new front garden up by the fence is doing o.k. The soil there is really bad, so I'm having to fertilize a lot. I have a few brugmansia seedlings planted up there, and they're growing o.k. The purple-leaf cannas are growing like mad, of course, but haven't bloomed, probably for lack of sun, but they're a touch of color anyway. 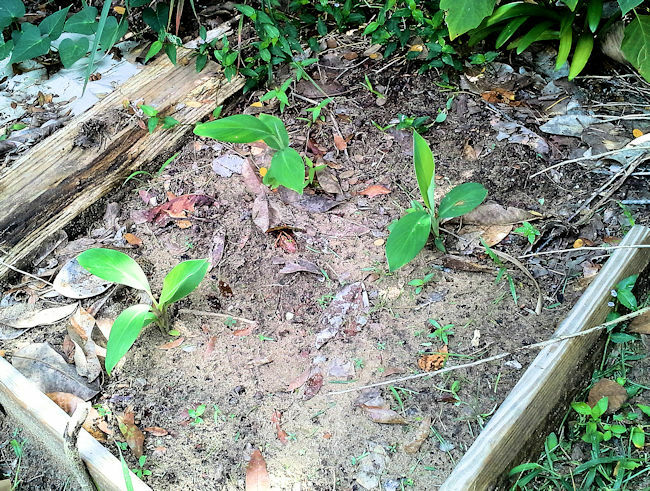 Remember that rotten banana corm I found when I dug up the large banana plant? Well, I cut it into four pieces and three of them have sent up plants. The other one still may eventually send something up, but I'm not holding my breath. 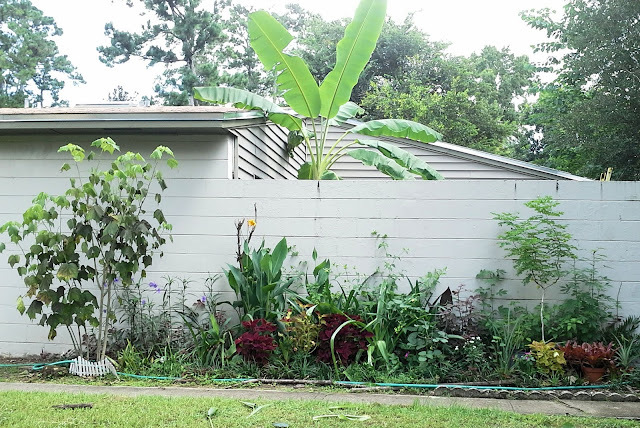 I have plenty of banana plants as it is. 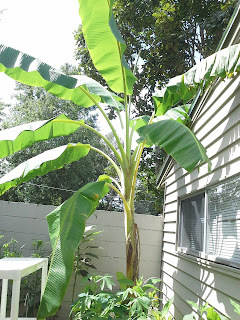 The large banana in the courtyard is still going strong and it has a sword sucker growing. 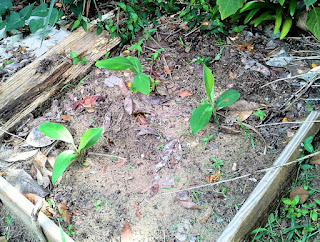 I also still have four pups from the other corm I planted, which I'm trying to dig and put into separate pots for sale later. I sold one large corm earlier in the summer, because I just had nowhere else to put it. 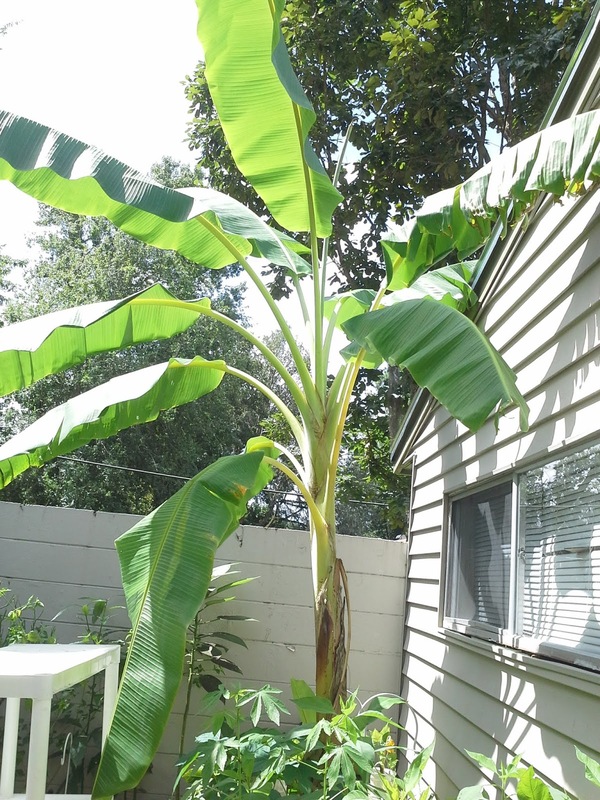 You can only have so many banana plants! Lots more going on, but this is getting too long, and I have other things to do, so goodbye for now. I hope you enjoyed this post and feel free to ask any questions in the comments.